Well it's okay I guess, but "Thank You" is much better. I don't really like Busta in this. I was concerned at the beginning, but it turned out well. Good track, though I would agree that 'Thank You' was better. Beat ist super. Der Song auch gut. 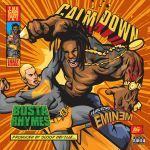 Busta just keeps going and going, just crazy flow. And Eminem's contribution is a noteworthy one, but it ends rather awkwardly.